Fun fact: The billboard on the opposite side is running an Apple iTunes ad. Catchy, yet sophisticated and original. Your witty comeback could win you a cool vSphere book! Got a pithy response to this new Microsoft cloud marketing line? Share it with the virtualization community by submitting a comment below for a chance to win a great prize. The possibilities are endless. Keep it clean. A panel of distinguished judges I will subjectively select two winners to receive copies of Eric Siebert’s excellent book, Maximum vSphere. Contest ends January 13, 11:59 p.m. PST and is open to everyone, but prizes will only be shipped to winners within the US. Two winners will be announced no later than January 17. Multiple responses are allowed — submit early, submit often. UPDATE: Check out the colorful commentary by Colin Steele at TechTarget. For some comeback inspiration, take a look at this classic Seinfeld scene. Just don’t go all George Costanza on us. Disclaimers: Book giveaways provided by publisher. Contest not sponsored by, nor affiliated with, any third-parties. No clouds were harmed in the making of this blog post. You need vendor lock-in too. vSphere, taking the Hyper-V entilation out of cloud computing. You also need patches, lots of patches… And security holes, you need those too. OMG Cloud me in the Neck! Yoda called…he wants his speech writer back. Don’t believe the hype mind-share does not equal market-share, VMware is the silver lining in the cloud. Microsoft – Transforming the cloud into fog. Feel the clouds without windows. Ask yourself “what would google do” 4 VIRTUALIZATION? Microsoft is in a coma. Creating products in every corner of technology does not make you a virtualization expert. Are you Azure of that? I’m pretty Azure that is decent. Like most MS offerings; Decent. Cloud you say? The vForce you must use. We’ve got our head in the clouds remembering the old days. That’s our solution. Boy, you guys at VMware must be feeling really sensitive if that’s what classes as an attack these days, it’s just a simple statement of fact. Yes, I would have thought that was reasonably obvious given the URL for my website. I thought that was Jacob’s submission for the contest. It’s pretty good. Have mission critical apps? Never rely on Virtualization technology that requires old Windows Registry code. The Microsoft Cloud – Where your head goes after pulling it out of your rump. Marketing alone does not a legitimate business make. Hahaha, marketing alone, I like that. a Clouded vision does not equal a vision of the cloud. Microsoft alone does not a Cloud Solution make. Virtualization without VMware does not a Cloud Solution make. Get vCritical on a Microsoft Cloud Solution. Some clouds may be formed of vapor but ours started with virtualization! Oops. I see someone beat me to that. The only thing you’ll get with a Micro$oft cloud is soaked. VMware: No windows need to be opened to experience our clouds. Mydoom, MSBlaster, Zotob, CodeRed, Conficker…Same target, same result. Virtualization is for proven technologies, not flawed ones of the past. Our vehicle does not need Windows to get to the cloud. ESX, all virtual, no monkeys. 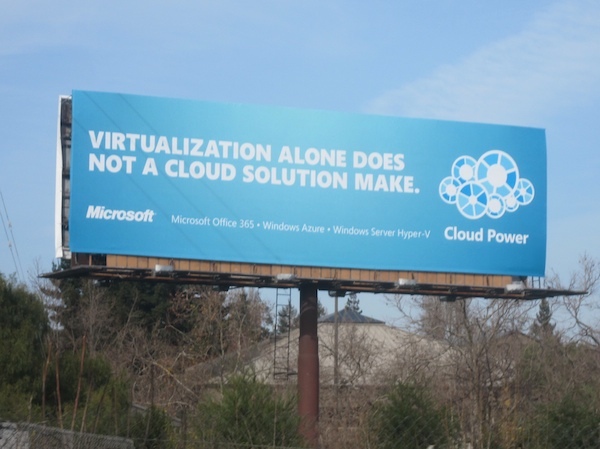 “Virtualization alone does not a cloud solution make” ? An OS that has both a browser and a (weak) hypervisor “bloated-in” does not a cloud solution make either. Dominance does not excellence make. Microsoft Alone (where they like to be) does not make a cloud solution !! How many times should you have to re-boot your cloud ? Limited visibility: Microsoft Cloud Power ahead. Windows alone does make a cloud solution break!! The VMware response is to provide superior cloud solutions. Fasten your seatbelts, it’s going to be a bumpy ride with Microsoft Cloud Power. Smooth your transition to the cloud with VMware. It’s hard to get to the cloud when your servers are stuck on the ground. Cloud alone does not an IT solution make. vCloud: no smoke (and no mirrors). VMware. The cure for the common cloud. “Marketing alone does not a cloud solution make”! So I guess the moral here is that the cloud also requires (and should be trusted to) an intern who works 24x7x365.